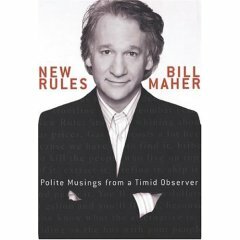 New Rules, Bill Maher’s new book, has shot up the bestseller list. It’s pretty funny. The really funny thing, though, is how little content it has—about one, one-sentence joke per page. The jokes are supposed to be about the way things have changed (hence the title). I like Bill. I ran into him at the West Hollywood Book Fair last Sunday where he was signing his books. I’m sure his TV program is funny even though I don’t watch it because I don’t get HBO . He’s a indispensable antidote to much of the political silliness going on today. Sumo is not a sport—it’s an eating disorder. Leaving aside what this has to do with being a “new rule”, what’s our friend Bill doing engaging in dime-store humor about Orientals? What’s next, jokes about buckteeth? Has he ever seen a sumo match or bothered to learn anything about the sport? Perhaps he’d like to wrestle with Chiyonofuji, the great yokozuna whose 31 championships are second only to Taiho’s and whose body fat ratio would probably put Bill to shame. “Wolf”, as he was known, could lift Bill up with one hand and drop him on a pile of remaindered copies of “New Rules”. Or going back a bit further, perhaps Bill would like to wrangle with Wajima, another yokozuna who weighed in at a scrawny 132kg during his heyday in the ‘70s, when I first visited Japan. Or maybe Bill would like to learn about the scores of kimarite winning techniques. Bill could even widen his horizons and learn about how sumo and sumo-like sports are popular thoughout Asia, notably in Korea and Mongolia, where it is said to date back to Genghis Khan. And instead of pandering to the ill-informed image of sumo wrestlers as fat bozos with an “eating disorder”, he could learn about their food culture and their remarkable chanko nabe stew. This entry was posted on Tuesday, January 11th, 2005 at 22:00	and is filed under history and culture. You can follow any responses to this entry through the RSS 2.0 feed. You can leave a response, or trackback from your own site. Perhaps Mr. Mahr recently read chapter 1 of Freakonomics which discusses in detail how the sport of sumo is often rigged.